Appropriate training on return to exercise. How to avoid common mistakes. For many people the start of a new year is a catalyst for resetting your health, fitness and lifestyle goals. As part of this process many people embark on a new fitness or exercise regime. However, should the training be inappropriate or performed incorrectly, a person will potentially sustain an injury which will sabotage their ability to achieve these goals. What we will discuss in this article is ways to avoid these commonly made mistakes and the injurious consequences that may occur as a result. Often the biggest mistake people make is overestimating their current level of fitness or training capacity. People commonly remember what their fitness or training levels were like the last time they exercised. However, this may have been 6 months, 12months or even 5 years prior. They then use this as the basis for their new training/fitness program. With any activity you should always start your training at an appropriate level. This training should reflect your exercise history and current level of fitness. Training should then build gradually and systematically over time. Failure to do this will result in overloading structures within the body which will consequently lead to injury. Structures within the body commonly injured due to this overloading profile are tendons, bone or muscle. Tendons injured by running based activities, are the Achilles tendon, patellar tendon or gluteus medius tendon. The plantar fascia is a tendonous structure in the foot that is also a commonly injured due to overload. These tendons progressively get more painful over time and if left untreated will worsen to the point that the individual needs to stop activity. Bone overload also generally occurs in the lower limbs and will present as a stress fracture or stress reaction. Common sites of a stress fracture/reaction are the bones of the foot such as the metatarsals or navicular, but also present in the lower leg – tibia (shin splints) and fibula. Muscle injuries can occur due to overloading, usually in activities that require repeat acceleration/deceleration and/or high speed running. For example: tennis, basketball and sprint/interval training. Common muscle groups injured are the hamstrings (speed and repeat acceleration/deceleration, quadriceps (kicking based sports or activities – such as AFL and soccer) and calf. Calf strains are more prevalent in the 30-50 year old age group, often after the resumption of running based activities. Be honest about your current fitness levels and training history. Design a training program that starts at a level appropriate to your current fitness levels. Your training program is progressively overloaded. This should include a gradual progression of distance, speed, weight (for strength based activities) and skills (eg kicking). Take into account your past injury history, potential weaknesses and physical deficits. Often these limitations can still be prevalent years after the initial injury and may hamper your ability to undertake certain activities. Take into account your biomechanics and how your body is built – this may impact on your selection of footwear, running surfaces and types of activities you undertake. Should you wish to be assessed or receive advice regarding resuming physical activity, or be prescribed an appropriate training/exercise program then contact us at Restore. 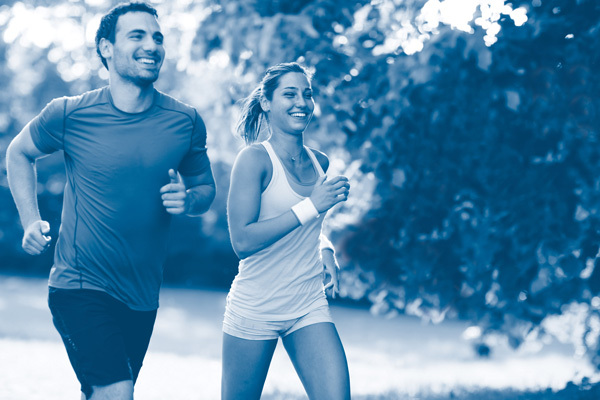 Prevention is often better than the cure – and our highly trained and skilled physiotherapists have wide experience dealing with not only elite athletes and weekend warriors but individuals taking up activity for the first time. Our physiotherapists will be able to guide you through an appropriate plan to ensure you reach your goals for 2019. Because at Restore your well-being is our priority. Over the years I have had many patients expressing concern when they experience noise when moving their joints and question whether further damage is likely to occur if they produce these sounds while exercising or participating in various activities of daily living. Based on this, I am going to explain what crepitus is in a little more detail, outlining the mechanism in which this occurs and when/if you should be concerned. Crepitus describes a crackling, creaking or popping noise or sensation that may occur whilst moving a joint. Most commonly, individuals will note crepitus in their knee joint but can occur in any joint within the body. Tendon snapping over bony protuberances. Connection between the two joint surfaces acts as a vacuum causing gas bubbles within synovial fluid (joint lubricator) to create a popping sensation. Normal fluid flowing through slightly rough surfaces may cause a fine grating sensation. Does the cracking sensation mean that I have Osteoarthritis? Not necessarily. Interestingly, there has been research to say that individuals with Osteoarthritic (OA) joints often have a reduction, or loss, in vibration suggesting that these individuals may in fact be less likely to produce crepitus when moving their joints. What is the noise experienced when having joint manipulation (back cracking)? A 2017 study determined that there is no research that has been able to support a direct link between a noisy joint and pathology, and therefore in most cases you should not be concerned if you are experiencing crepitus without associated pain or locking. Should you experience any clunking, deep grinding locking or pain, it is advised that you seek an expert opinion from one of the physiotherapists at Restore to properly assess and manage your condition appropriately. Bianca graduated from The University of Melbourne with a Doctor of Physiotherapy degree in 2014. Prior to this she completed a degree in Exercise and Sport Science at Deakin University. Since graduating, Bianca has worked predominantly in the private practice setting treating a variety of Musculoskeletal conditions through manual therapy, dry needling, hydrotherapy and Clinical Pilates. In addition, Bianca has had exposure working as a physiotherapist in a sub-acute hospital, working with local football teams in the VAFA, as well as working part time as an Exercise Physiologist. As a physiotherapist Bianca draws on knowledge from her background in Physiotherapy and Exercise Science in order to tailor treatment to the individual needs/goals. She believes a holistic approach to treatment is vital to ensure best outcomes are obtained. 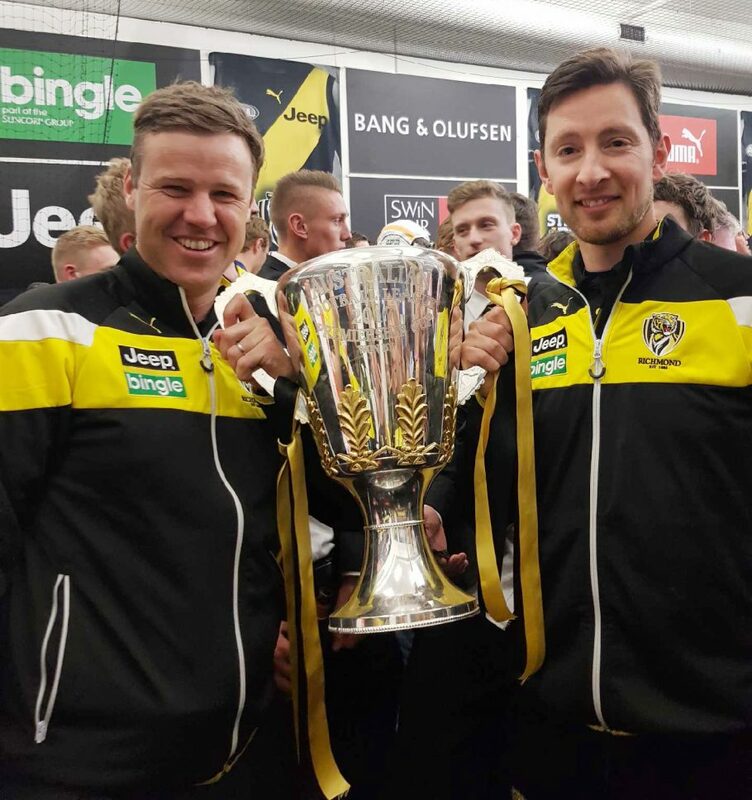 Restore Physiotherapy and Pilates Co-Director and Richmond Football Club Physiotherapist Stuart McKenzie provides some insights into the secrets of success for the Tigers 2017 Premiership Winning Season. I was fortunate enough last year to celebrate Richmond Football Club’s 11th AFL Premiership as part of the Physiotherapy Team. I have worked at Richmond FC for the previous 5 years and 2017 was an amazing season both on and off the field. People often ask me “What was different at Richmond during 2017?” “Was it the game plan with small forwards creating pressure?”, “Was it the superstar individual performances”, “Was it luck with no injuries?” The answer I think relates to much smaller individual things that happen at a football club often months and even years before success is achieved. These start off as small things, small changes, all contributing, and collectively aligning together at the same time to produce success. Two small things that happened which I feel contributed to the success of the team. Firstly, the much publicised ‘Triple H Sessions’ and secondly, allowing the players to have some fun again. The players started their 2017 campaign with a gruelling 7-day camp on the Sunshine Coast during January in the pre-season. It was on this camp that new and deeper connections were made between players and staff. Damien Hardwick, the Richmond Coach of the previous 7 years, introduced the ‘Triple H Sessions’. Each player over the course of the year would get an opportunity to talk in front of all the players and staff about their Hero, Hardship and Highlight. This powerful team building exercise resulted in players talking about family sicknesses and deaths, broken homes, and often emotional stories about difficult times in life. Everyone listened, everyone understood each other’s different life experiences. It started numerous conversations between players and a deeper form of trust was established. The players also developed their own set of values for 2017. This is not uncommon and I’m sure all clubs do this. One of these values was ‘Celebrate’. This can have a variety of meanings in different circumstances. For example, celebrate the victories, sing the song loud, celebrate that goal at the end of training, that tackle or spoil that resulted in a turnover. Each time do it with exuberance. Make playing football fun again. Enjoy your own and each other’s achievements. This I think is a great way to build confidence. Confidence in yourself and the others around you in your team can be very powerful. Two small things amongst many more. I’m lucky enough to have shared in the journey to the success of 2017. As I write this piece from our 2018 training camp, after the players have completed a gruelling training session, close to 4 hours in hot conditions, I’m reminded that success is what ever you define it to be. The players and staff are even more motivated for further success. Look out for Tigers in 2018!! Whilst there is nothing more satisfying than going out for an early morning run or walk or finishing off the day with either, we can suffer from various niggles that prevent us from enjoying ourselves, cause us pain and hence force us to stop. This article will explain common injuries sustained by walkers and runners that can be easily managed and prevented with specific physiotherapy manual treatment, prescribed strengthening exercises and clinical pilates. PFJ is pain experienced in the front of your knee or behind your knee cap , where your patella (knee cap) meets your femur (thigh bone), mainly caused by excessive pressure through the knee joint or poor knee tracking during repeated weight bearing exercises, such as running and walking. Poor biomechanical control when bending the knees as well as various weak muscles could be the contributing factors as to why someone may be suffering from PFJ. Simple strengthening exercises, soft tissue release through tight/sore muscles and correction of foot posture can alleviate the symptoms of PFJ and get you back to running/walking pain-free! Shin splints is an overuse injury caused by repetitive strain on your shin. The pain is caused by stress reactions of the tibia (bone) and muscles around it. The pain will most often be felt down the bottom of the shin during the weight bearing phase of running or walking, or repetitive jumping activities. The pain can be caused by a sudden increase in load, altered foot mechanics- e.g. poor foot posture/control, new footwear, exercising on different surfaces or calf weakness. Manual therapy such as massage, proper assessment of gait and foot position in landing combined with rest can alleviate symptoms and prevent it from occurring again. Plantar fasciitis is a pain on the bottom of your foot, normally experienced after exercise- not during it. Our plantar fascia acts as a shock absorber normally, lining the bottom surface of our foot, however in some instances micro-tears, inflammation and irritation can arise from repetitive stretching or increased tension. Poor foot mechanics, repetitive load, poor footwear (especially flat) and certain types of exercise can all aggravate our plantar fascia and thus cause pain. Assessment of foot mechanics and footwear, strengthening, taping, orthotics and manual therapy from your physio can all assist with the diagnosis and management. Pain experienced at the back of the heel is likely an achillies tendinopathy. It is pain caused by repetitive trauma in between which the tendon has no time to heal properly. Micro tears and collagen damage to the tendon are the main source of pain. Similar to plantar fasciitis, poor footwear, repetitive running (especially long distance), poor running technique, training surface and muscular weakness (calves especially) can be contributing factors. Pain is normally worse after exercise is completed, and is especially stiff when a person first wakes in the morning. It is commonly very tender around the affected area and whilst runners may notice it at the commencement of a run, it normally feels better or “warms up” during and then pain occurs again once the run is complete. Stretching, targeted strengthening, rest, ice, manual therapy from your physio and possible orthotics can ease the associated symptoms of an achillies tendinopathy. Pain at or around the hip joint in the glute area during running or walking is normally a tendinopathy of the gluteus medius tendon (basically- a tendon that is aggravated by repetitive load and use). The pain is normally when you are using the tendon such as walking, running, jumping, normally very stiff especially in the morning and you may even feel or hear a “click” or “crunching” sound when the tendon is being stretched or used. General wear and tear as we age or over using the muscle/tendon can stress the tendon, and although tendons are built to withstand high loads, occasionally the load becomes too much and the tendon can becomes damaged. Rest, ice, biomechanical assessments, targeted strengthening, clinical pilates and soft tissue release from your physio can improve hip pain and get someone back to pain-free walking or running. If you are experiencing one or more of these listed pains or conditions we strongly encourage you to be proactive and seek treatment not only to alleviate symptoms but also improve your overall running and walking, meaning you can perform better-for longer! I have been involved with long distance running since as long as I can remember, and having experienced one, if not all of these niggles at some stage I cannot stress enough the importance of fixing them- not only are they annoying but they really hurt! My running has benefited greatly and my body has definitely thanked me for it! Freya graduated with a Bachelor of Health Sciences and a Masters of Physiotherapy practice degree from La Trobe University. She has completed various clinical Pilates courses and has a keen interest in sporting injuries and rehabilitation, in particular return to running. Freya is also the physio for an under 18-rugby team and is in the process of undertaking further education to enhance her musculoskeletal and sports physiotherapy practice. 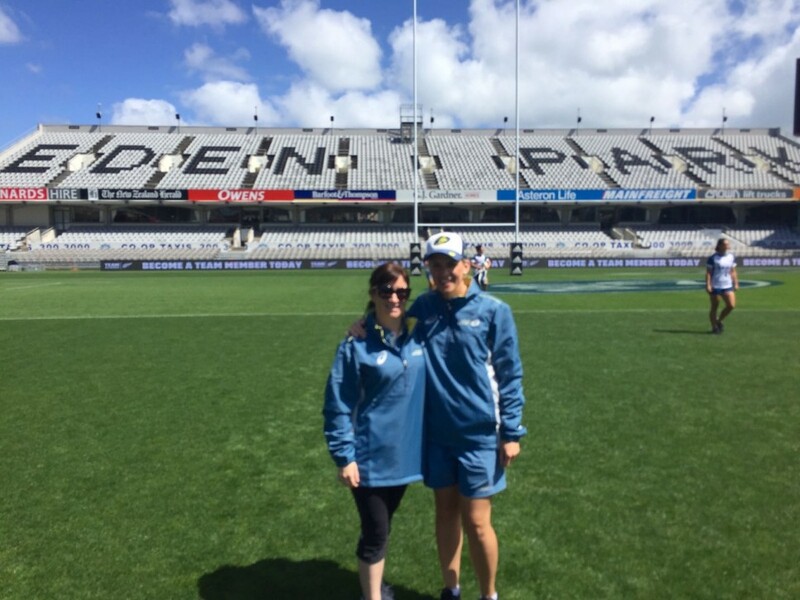 In October I had the opportunity to travel to Auckland with the Wallaroos, the Australian Women’s XV Rugby Union team, where they played a test against New Zealand. Being a physiotherapist travelling internationally with a sports team is quite a unique and rewarding experience. Days would commence with a full buffet breakfast followed by carrying out screenings on each of the girls. The screenings involved a battery of tests to assess and identify any risk factors likely to increase the likelihood of injury. In particular for Rugby we were interested in assessing the function and strength of the muscles around the hips and pelvis as these were placed under significant load with the intensity of trainings and games. If any of the tests were significantly different from the day before or the baseline scores this was an opportunity for the girls to either do some specific stretching or muscle activation exercises or to receive physiotherapy treatment to try to return the scores to their usual level prior to the next training session or game. Following the morning screenings we often had an opportunity to assess and treat any of the athlete’s injuries and then it was taping time. This involved taping techniques which were either preventative or to support and protect a previous injury, the physiotherapy room was always a buzz of activity at this time. Once the taping was complete it was on to a training session, during these sessions the physiotherapist’s role is to be on hand if there are any new injuries or ‘niggles’ which arise during the session and also to provide advice to the coaching staff if there are certain aspects of training athletes carrying injuries should avoid or modify. On any given day there would be up to two training sessions as well as a gym/weights session. In between these sessions there were times to provide physiotherapy treatment as well as meetings where the physiotherapy and medical staff liaise with the coaching and team management staff to ensure everyone is up to date. 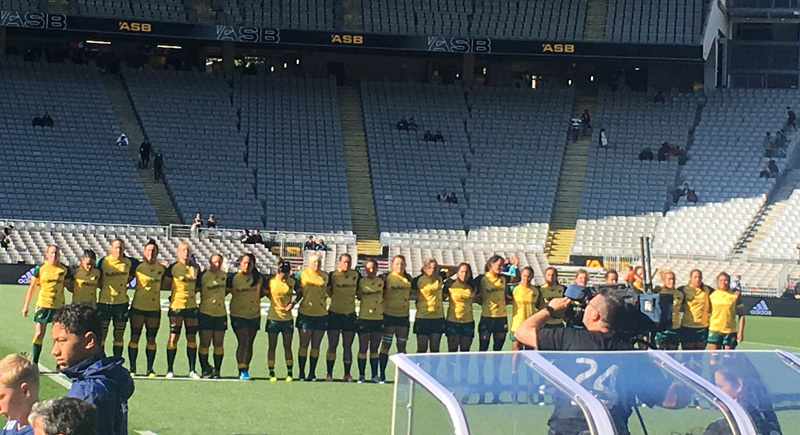 While in Auckland the Wallaroos played a curtain-raiser to the Bledisloe Cup at Eden Park against the New Zealand Black Ferns. On this game day we began as usual with screening assessments and treatment, followed by meetings. The Wallaroos then had media commitments and a jumper presentation which was performed by Australia’s Foreign Minister Julie Bishop. After these formalities it was straight to taping, the most common types of taping included ankles, shoulders, knees and thumbs. During the game it is the physiotherapist’s role, along with the doctor, to assess any injuries which arise and provide treatment and information to the coaching staff on what if any role the athlete can continue to play in the game. Unfortunately the results didn’t go the way of the Wallaroos however it was a great experience for all of the athletes as well as the physiotherapists! Traveling with a sporting team as a physiotherapist provides a great opportunity to put into practice all aspects of sports physiotherapy including assessment, treatment and management of sporting injuries as well as injury prevention programs. The experience has been a fantastic opportunity which has enhanced my physiotherapy skills which I am excited to be able to bring back and apply to my patients at Restore Physiotherapy and Pilates. Anna graduated from Curtin University in Perth in 2008. She completed a Graduate Certificate in Sports Physiotherapy in 2013 and is in the process of completing a Masters degree in Sports Physiotherapy. Anna has provided physiotherapy services to WAFL and VFL teams and has had experience working with tennis, baseball and rugby teams. She is particularly interested in treating sporting and adolescent injuries. As part of our commitment to providing the highest quality and leading edge health care, Restore Physiotherapy and Pilates is pleased to announce that we now have the ability to assess and train the deep abdominal and pelvic floor muscles using Real Time Ultrasound. High frequency sound waves are emitted from a device. These sound waves penetrate the body and provide a picture of the muscles contracting and relaxing on a monitor. It is the same technology used to image unborn babies during pregnancy. Using this technology both clients and physiotherapists will be able to visualize the deep abdominal muscles, as well as the pelvic floor muscles contracting. This is very exciting as these muscles are located deep within the body often making it hard for both the physiotherapist to assess and patient to feel in normal circumstances. Research shows that these muscles are an important support system for your spine and rehabilitation of these muscles after pain or injury is essential to prevent further pain episodes. What are the benefits of using Real Time Ultrasound? With most muscles in our body we can see when they contract and relax, giving us immediate feedback regarding whether these muscles are engaged. The advantage of Real Time Ultrasound is that it provides the patient and physiotherapist with a visual cue as to when these muscles are being activated. This gives the patient instantaneous feedback about correct contraction and activation of these important supportive muscles. This enhances the rehabilitation and training of these muscles, ensuring you not only return to normal movement and function sooner, but helps minimise the risk of further injury. Real Time Ultrasound is a painless and non-invasive procedure. The Physiotherapist places a water based gel on the skin of your lower abdomen. A probe glides over your skin and images of your muscles are seen on the screen. The Physiotherapist will assess activation, timing and co-ordination of your muscles to determine whether they are working effectively to support your spine. You will also be asked to contract and relax your muscles and you will learn how to do this correctly. All Initial Pilates Assessments at Restore Physiotherapy and Pilates will now include Real Time Ultrasound as part of our commitment to providing the highest quality health care to our clients. Existing clients also have the opportunity to book in for a separate session to experience the benefits of using Real Time Ultrasound in rehabilitating the deep abdominals and/or pelvic floor, and assist in returning to full health and function sooner. To book an appointment or for more details, call reception on 9855 1122. 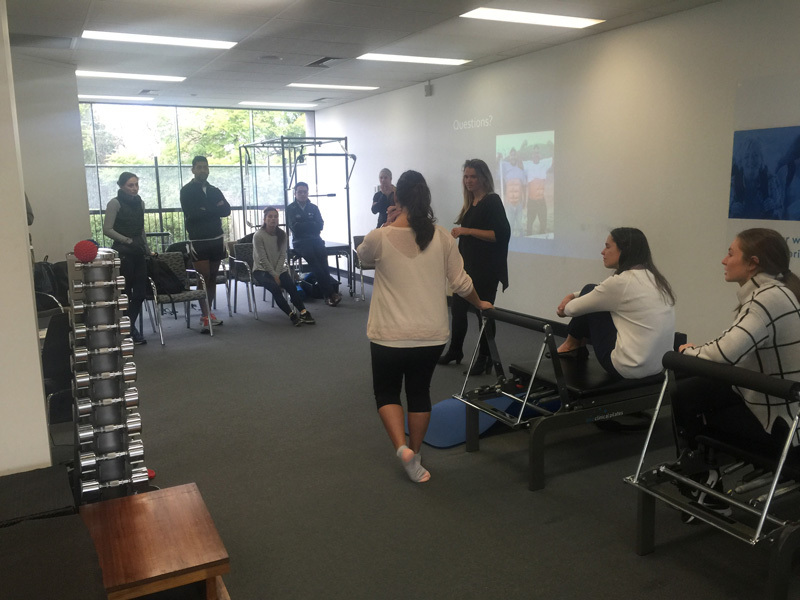 Last month Restore Physiotherapy was pleased to welcome a special group of visitors to our clinic – the Victorian based Sports Registrars. The Sports Registrars are a cohort of doctors undergoing their sports medicine training through the Australasian College of Sport and Exercise Physicians. As part of their training, Restore Physiotherapist Kathleen Pettyfor had been invited to present to the group on the topic of Lumbo-pelvic stability, Clinical Pilates and its application within Sports Medicine. Having worked at Restore as a Physiotherapist and Clinical Pilates Practitioner, with Melbourne Football Club as their Pilates Physiotherapist and as a tournament physiotherapist for Tennis Australia – this was a topic that Kathleen was very pleased to present on. The presentation involved a lecture explaining the theory and current research associated with Clinical Pilates, and discussion around the topic of movement “stability”. Kathleen was lucky enough to have a willing Restore client participate in the presentation, so that an interactive patient assessment and Pilates treatment could be demonstrated for the doctors. This was a great opportunity to work through some of the biomechanical assessments that Physiotherapists conduct whilst having input from the Registrars. Following the presentation (and some morning tea – thanks Zach! ), it was time for the Sports Registrars to get involved by performing some Clinical Pilates of their own! 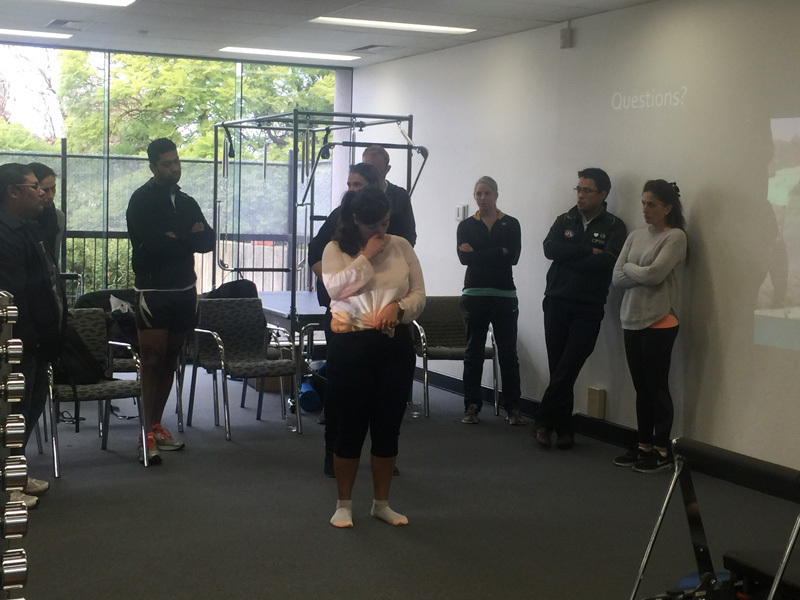 After breaking into small groups, the Registrars worked their way through beginner, intermediate and advanced exercises with the close supervision of our physiotherapists – Kathleen, Tamara, Laura, Anna and Rachael. We were very impressed with some of the registrars Pilates skills! The morning was a great success and we were pleased to receive some great feedback from those who participated. Our physiotherapists commonly work in conjunction with Sport and Exercise Physicians in the rehabilitation and management of musculoskeletal injuries, and also chronic disease. We were very privileged to host the Registrars at Restore and have Kathleen assist in their training. We would like to thank all our regular Friday morning clients for your flexibility in allowing us to reschedule your classes for this one off occasion. Thanks also to our Friday afternoon clients, for your help with finishing off the left over morning tea!! Many people are aware of Clinical Pilates being used effectively by physiotherapists for the rehabilitation of injury. The general understanding is that Clinical Pilates helps to engage the ‘core muscles’, thereby improving core stability. However, Clinical Pilates can be much more versatile, targeting many different goals for a range of different clientele. I am commonly asked whether Pilates is used within elite sports as part of injury management. The answer is yes – and its application often extends beyond the realm of just rehabilitation. The Clinical Pilates program at Melbourne Football Club has been designed to encompass rehabilitative, preventative and physical performance goals. Athletes undergo screening by the clubs physiotherapy staff at the start of pre-season which involves a comprehensive physical assessment. These findings help form the basis of each footballer’s individualized Pilates program. Some common goals are to improve trunk stability, flexibility (commonly neural, hamstring and trunk), hip and lumbo-pelvic control, balance, movement patterns and may also include injury rehabilitation. Most exercises are completed on reformer machines with the athletes completing their specific programs under supervision by myself in small groups. Exercises are progressed when appropriate to ensure the athletes are continually challenged. All athletes have access to the Pilates program, however there is a stronger focus on working with the younger athletes (1-4 years) to help aid with their body awareness and movement control. The Pilates exercises do not substitute gym or conditioning work, but are rather complementary – with the aim that improving movement control and awareness will assist the athletes in other areas of their training. For example, an athlete might be able to lift with better technique in the gym if they have better control around the lumber/pelvic region. Whereas some athletes find the dynamic flexibility component of Pilates important in their post training recovery. Improving movement efficiency or having improved glute function may also optimize a player ability to run, jump and land with reduced risk of injury when fatigued. In summary, Clinical Pilates has many benefits and its application in sport and AFL football is very relevant. No matter which sport you play, Clinical Pilates can be tailored towards injury rehabilitation, prevention, post training recovery, increasing flexibility or control, and general maintenance. We are more than happy to assist you if you feel Clinical Pilates could help achieve any of your athletic goals. Kathleen graduated from Monash University in 2010, and completed her DMA Clinical Pilates training in 2011. Since this time, she has worked across a range of recreational and elite sports including netball, surf lifesaving, triathlons and tennis. From 2012-2014, she was the physiotherapist at the Casey Scorpions Football Club (VFL). Since 2015 Kathleen has worked with the Melbourne Football Club implementing their Pilates and core stability program. Kathleen has a special interest in Clinical Pilates, rehabilitation of sporting injuries and chronic back pain. Aside from her private practice and elite sports work, she also has experience as a physiotherapy educator to the LaTrobe University undergraduate students. Kathleen is currently completing her Masters degree in Sports Physiotherapy. What is your involvement with tennis? I have been lucky enough to be involved with Tennis Australia as a tournament physiotherapist over the past 12 months. Tournament coverage can involve working with junior, pro-level and wheelchair tennis players. Just recently, in December 2015, I was part of the physiotherapy team at the December Showdown at Melbourne Park. The Showdown is a large 16-day tournament that encompasses the Australian Junior Championships, State Teams Events and the Australian Open Wildcard playoff. What are the most common injuries treated? The injuries which present to the physio room during a tournament can be highly variable. Back pain, particularly in the lumber region, is a common injury in tennis. Large rotational and compressive forces go through the spine during serving and when hitting forehand and backhand. Tennis involves a large amount of repetition with players having daily practice, playing doubles and singles matches often on the same day, and playing back to back tournaments. This repetition often plays a role in the presentation of back pain. Shoulder overuse injuries are also frequent, along with elbow and wrist pain. Tennis requires sound rotational flexibility and/or stability at the shoulder when hitting, and players lacking this control may be at risk rotator cuff and tendon injuries. An injury quite specific to tennis, though definitely not as common, is a humeral stress response. This injury occurs in the upper arm, near the bicep region, and is usually found in young players who are playing large volumes of tennis during a period of growth. Due to the stop-start nature of tennis and the amount of agility required, tendinopathy injuries in the knee and Achilles are often encountered. Blisters and calluses can also be a recurrent issue for many players. Abdominal strains are seen when a player may be reaching on maximum stretch to hit a smash or when serving. During summer months, players are at higher risk of heat stroke and dehydration – though measures are taken to try and avoid this with player education regarding hydration, ice towels, pre-cooling showers, and heat rules. What does an average day working at a tournament involve? The physio room opens an hour before the start of the first match and closes one hour after the end of play – days can be very long! Players come in to get treatment prior to their match and many like to have their ankles taped. Some players may require taping for other injuries such as abdominal, shoulder, wrist, or elbow. Often at ITF tournaments the physio will be the only health professional at the tournament, so we are required to provide blister, callous and nail care, and provide referrals to the podiatrist when needed. Over the day, we will attend to players for injury assessments, treatments, post-match recovery, medical clearances or withdrawals and will attend court calls if a player sustains an injury during a match. What can I do to help prevent injury? Good trunk control, strength and shoulder stability is vital for preventing injury in tennis, and these areas should be targeted in your training program. Load management is also important, especially for junior players with growing bodies. Involving your coach to make sure you have good technique, especially when hitting shots such as a kick serve is imperative. If you think that you may be developing an injury or have started to feel pain or discomfort playing, make sure you see you seek advice and early management from your physio! Kathleen graduated from Monash University in 2010, and completed her DMA Clinical Pilates training in 2011. Since this time, she has worked across a range of recreational and elite sports including netball, surf lifesaving, triathlons and tennis. From 2012-2014, she was the physiotherapist at the Casey Scorpions Football Club (VFL). Kathleen has a special interest in Clinical Pilates, rehabilitation of sporting injuries and chronic back pain. Aside from her private practice work, she also has experience as a physiotherapy educator to the LaTrobe University undergraduate students. Kathleen is currently completing her Masters degree in Sports Physiotherapy. What do Physiotherapists do on Game Day? I have had the pleasure of working for 3 different AFL clubs over the last 10 years (St Kilda, Gold Coast and Richmond FC) and the game day role remains challenging and enormously rewarding. Players arrive at the ground usually two hours prior to the game starting. Players like to familiarize themselves with the ground, check the weather/wind direction, check the grass surface and decide which boots to wear etc. We have two Physiotherapists work on game day and we are ready to treat the players from the time they arrive. Treatment pre game consists of specific strapping of ankles and shoulders and a variety of other body parts when needed. Taping provides the players with a sense of support, can be used to restrict joint movement, and some evidence suggests it may reduce injury severity. We use mobilization and soft tissue techniques to loosen up stiff ankles and lower backs. We also provide massage when required. We help players complete specific warm up exercises utilizing resistance bands and weighted vests. Almost all of the players would check in with us or get treated pre game. Once the game begins, we have two Doctors and two Physiotherapists that sit on the interchange bench. We all continually monitor the players injuries and provide treatment. Most small injuries can be dealt with on the side of the field, but more serious cases require change room access where we can utilize equipment to assess and treat injuries. Most commonly we see sprained ankles, dislocated fingers, muscular contusions and strained muscles. Rarely, we may see a fracture or concussion that requires stretcher retrieval from the field of play. In these cases, both Doctors and Physiotherapists follow a strict protocol to ensure player safety. If a player is able to safely return to play then they are closely monitored. If required we can reduce game time exposure by increasing interchange rotations for individual players. As the game progresses into the fourth quarter we can get very busy on the interchange bench. Monitoring 3-4 players with game day injuries and managing muscular cramp in fatigued players. Post game, injury management begins straight away. All players will check in with the Doctor and Physiotherapist regarding injuries sustained. Treatment begins immediately (compression/ICE etc.) and players are given an initial 24hour plan. Post Game recovery for the players is either at our training facility when playing in Melbourne or at our hotel when travelling interstate. This consists of Ice Baths, Pool Recovery, Massage, Stretching, Rehydration/Food Replenishment and can take players up to 2 hours to complete. Stuart McKenzie is a director at Restore Physiotherapy & Pliates. He has worked as a physiotherapist at the Richmond Football Club for the past 3 seasons. Stuart’s role involves match day coverage as well providing physiotherapy services to the players during the week. Prior to Richmond, Stuart had stints at both the St Kilda and Gold Coast Suns Football Clubs.